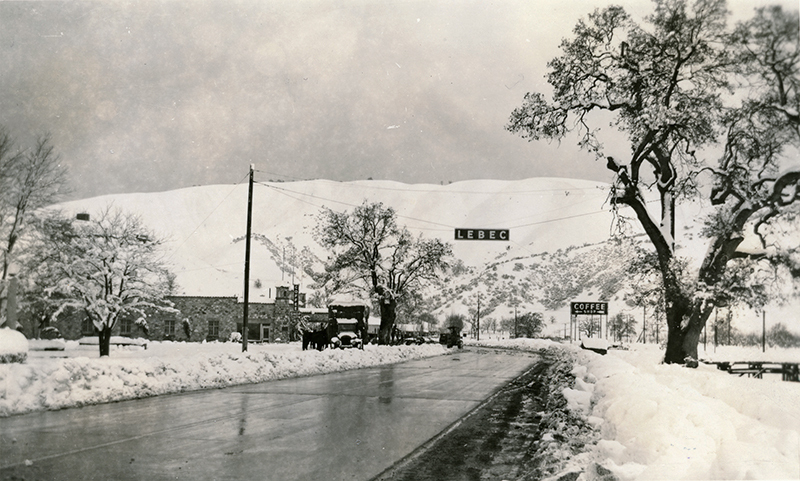 SCVHistory.com LW3232 | Ridge Route | Hotel Lebec Coffee Shop in Snow, ~Late 1920s. Hotel Lebec Coffee Shop in the snow, probably soon after the rock structure was built in 1925 to replace an earlier assemblage of wooden buildings that had burned down in 1923. The road is the Ridge Route. Horses, box truck, cars and snow plow parked in front. Real photo postcard with undivided back; otherwise blank on back. According to Ridge Route historian Harrison Scott (2007:6-9), Thomas O'Brien, a saloon keeper from Bakersfield, purchased acreage in Lebec in 1913. In 1915 the original Ridge Route highway came through, and O'Brien built the first Lebec Hotel, which consisted of a general store, lunch room, auto garage and 25 cabins on the west side of the highway. Then in 1919, in partnership with Russell Clifford Durant, son of the founder of General Motors, O'Brien started construction on the ultimate Hotel Lebec, initially called Hotel Durant, behind and just south of the cabins. It opened May 21, 1921. Soon thereafter, Durant's father withdrew the financing and O'Brien became sole owner and changed the name to Hotel Lebec. "The hotel never was the cash cow (O'Brien and Durant) thought it would be," Scott writes (ibid.:9). "For one thing, cars were constantly being improved and were able to cover greater distances. Why stop at an expensive hotel in Lebec when you could continue another 40 miles and be in Bakersfield?" O'Brien sold the hotel to Foster Curry, son of the concessionaire at Yosemite. Early postcards from this period show the hotel under its brief stint as "Curry's Lebec Lodge." It was during Curry's brief ownership that all three buildings down on the Ridge Route encompassing the general store, restaurant, garage and a number of houses, burned to the ground. The $60,000 fire in November of 1923 started early on a Sunday morning. The Lebec Lodge as it was called then miraculously escaped the flames. Curry had not attended to cleaning the grease from the restaurant's flue on a regular basis. Curry had the hotel about a year when a dispute developed that ended in court with a judgment favoring O'Brien. Once again O'Brien became full owner of the hotel. In 1925 he constructed a large stone building to replace the three structures he had built years earlier that were destroyed in the fire. Constructed of stone, O'Brien vowed it would never burn down again. The new building occupied the same general location as the buildings that were consumed in the fire. The new rock structure housed a coffee shop, bar, grocery store, post office, Richfield gas station and an extensive garage. The garage had a tow truck and two mechanics. ... The coffee shop, bar, grocery store, gas station and garage generated $50,000 clear per year, a far better return than the hotel. LW3232: 9600 dpi jpeg from original RPPC purchased 2018 by Leon Worden.